Lemon rice is a vibrant coloured aromatic rice that whole family including children will enjoy. Butternut pumpkin curry is such a mouth watering combination for lemon rice and form a nourishing meal for Autumn. It’s easy to prepare lemon and butternut pumpkin curry with just a few ingredients and some spices. 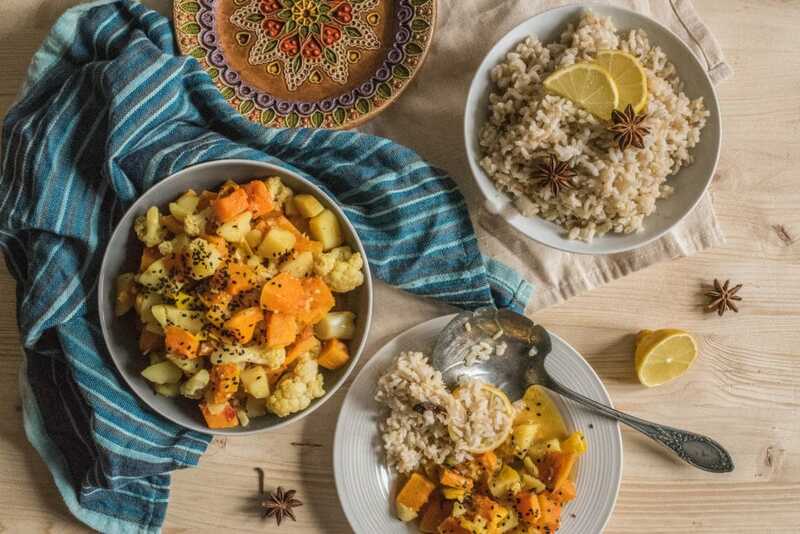 Butternut pumpkin curry is light but still a filling curry with roasted butternut squash and sweet potatoes in creamy spiced coconut milk sauce and a sprinkle of crunchy black sesame seeds. This recipe is ideal for cooler seasons and Vata. Pitta and Kapha can also enjoy as long as it’s not too often. in the oven for 20 minutes by sprinkling coconut oil, ghee or olive oil, or until soft as needed. Meanwhile, boil cubed sweet potatoes. Halfway of boiling add broccoli and finish boiling together on low heat. Take a small saucepan to add coconut oil, minced garlic, curry leaves and finely chopped chili pepper. Let it fry for a few minutes and add coconut milk and remaining spices. Stir well to combine everything equally and simmer for another couple of minutes. the flame simmer. Add turmeric and salt. Add lemon slice, black pepper and anise stars. Continue boiling for another 12-15 minutes or until water is absorbed and the rice is fully cooked. Add 1-2 teaspoons of ghee and the rice is ready to serve. 1. You may use the same recipe with potato and cauliflower to bring some variety if you have a healthy gut. 2. You may reduce the oils if you have kapha imbalance. You can use olive oil instead of coconut oil and ghee. 3. Feel free to add more coconut milk if you prefer more sauce.